While the pork is cooking, mix together the sweet chili sauce/glaze. Place all the ingredients in a medium-sized sauce pan. Bring to a boil then reduce down to a simmer. Let the sauce simmer for about 15 minutes. Brush over cooked meat and serve. TIP: While cooking glazes and sauces especially ones with sugar in them, be careful about over heating. I like to keep a low heat and if you notice that the sauce is becoming to thick just simple add a splash of water to thin it out. 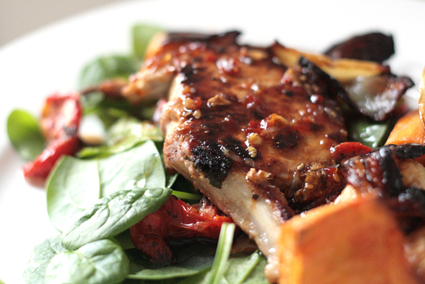 Served with semi dried tomatoes, baby spinach, slow roasted shallots & caramelised sweet potato.